Perfect for DJ use, bars, karaoke parties, etc. Unit Dimensions (Inches): 9.1" x 5.1" x 4.3"
Shipping Dimensions (Inches): 9.8" x 6.7" x 7.9"
Chauvet DJ SM 250 Portable DMX Snow Machine with Wired timer Remote SM250 . High output snow machine that will add the look of snow to any event large or small. User-friendly volume adjustment using the included wired timer remote, DMX and Digital Display. Convenient Hi/Low blower switch for near or far coverage. Uses non-toxic water based snow fluid safe for all environments. Included wired timer remote and built in DMX. Output: capacity 3,000cfm (cubic feet per minute. 3.5 minute start time (fastest on the market for a similar priced unit). Manual fog button. Wired remote included . Wireless timer remote included. Hit one button and 30 seconds of fog will come out. 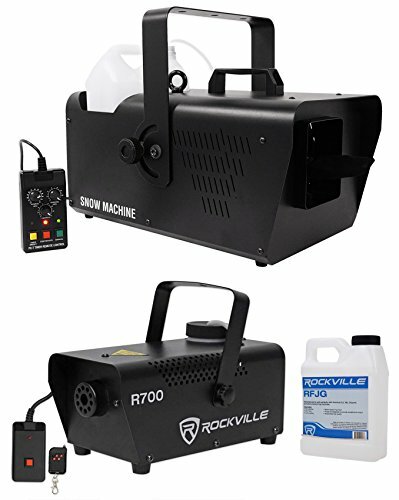 Water-based fogger compatible with standard fog fluid made by Rockville, Chauvet, American DJ, Visual Effects, and other famous brands. 10 Fluid ounce tank capacity. Fluid consumption: 10 Fluid Ounces per hour . Our fog machine will output literally twice as much as other machines being sold by other famous brands. Ours is way better. If you are not happy with it, we will send you a pre-paid label and give you all of your money back. Compact and powerful. This machine is portable yet more powerful and reliable than machines triple the price. Strong enough for indoor or outdoor use. This machine produces a thick fog capable of staying in the air for a long time. Perfect for DJ use, bars, karaoke parties, etc.. Power and current: 110V, 60Hz: 440W, 5A operating. AC power: 110V Only. Unit Weight: 3.3lbs . Unit Dimensions (Inches): 9.1" x 5.1" x 4.3" . Shipping Weight: 3.7 LBS. Shipping Dimensions (Inches): 9.8" x 6.7" x 7.9" .